Dr. Emmo’s First Aid products are designed to provide antimicrobial irrigation and protection for minor pet wounds. Dr. Emmo’s has created two proactive pet care product lines (horse and dog) based on the revolutionary ingredient called Hypochlorous Acid. The natural, safe and effective Hypochlorous Acid molecule is similar in makeup to the one found in human white blood cells which are used to fight and remove bodily infections. 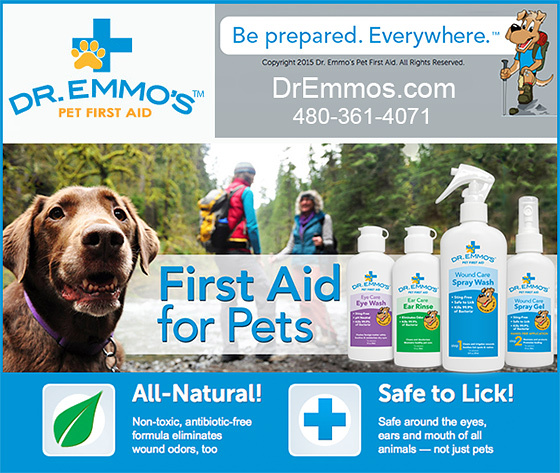 Dr. Emmo’s revolutionary first aid products have changed the way pet lovers think about animal care and safety. Why not have the best protection for the unexpected? Dr. Emmo’s products are antibiotic-free and safe for all types of animals. The formulas have been tested by and received rave reviews from veterinarians, animal professionals and pet owners. Best of all, while our all-natural Pet First Aid Wound Care Spray Wash, Spray Gel and Ear Care Rinse are strong and effective, they are safe to lick, too. Be prepared. Keep a set in your camping gear, travel bag and medicine cabinet! What Sets Dr. Emmo’s Apart From Other First Aid Sprays? What Are The Canine Products From Dr. Emmos? Dr. Emmo's Wound Care Spray Wash is the first step in a two-step process of handling minor cuts, scrapes, and skin irritations. It's designed to be applied with a fine cleaning spray to thoroughly rinse, remove, and eliminate bacteria in all minor pet wounds. Like all our products, Dr. Emmo's Wound Care Spray Wash is antibiotic-free and safe for all pets' bites, rashes, and nips. It's an antimicrobial solution that safely kills common animal germs and infection causing bacteria..
What Does It Mean AntiBiotic Free? Why Is That Important? Dr. Emmo’s products have been proven to be non antibiotic resistant meaning; its main ingredient, hypochlorous acid does not create an environment where bacteria, and other microorganisms which when encountered in-solution and eliminated over time, will have any future ability to “resist” or build up a resistance-reaction against its original effectiveness. The benefit of this feature allows for a safe continuous use of the product for indefinite periods of time. Is It True That All Dr. Emmo’s Products Are Safe To Lick? Dr. Emmo’s products feature a “safe to lick” and “safe to use around the eyes” claim. Stringent independent laboratory testing confirms the “natural and safe” effect of Dr. Emmo formulations and their lack of any toxicity and cytotoxicity issues. The safety of the active ingredient has been thoroughly tested and affords both the animal and the user the utmost confidence in these claims. How Often Should I Apply Dr. Emmo’s To Wounds and Cuts? Based on the testing and formulations used in Dr. Emmo products; it is safe, and recommended, that they be used on as a needed basis. From everyday application to multiple applications per hour the safety and naturalness of the ingredient provide for safe irrigation, cleansing and proper long term wound site management. Make Sure You Have Dr. Emmos For Your Dogs Today! Doesn’t your dog deserve the best? DrEmmos has no competitor and is affordable enough for every household. Find us at DrEmmos.com or at VetDepot and even Amazon— and other dealers who insist on carrying the best for your dogs. Call us today and tell us about your dog today!